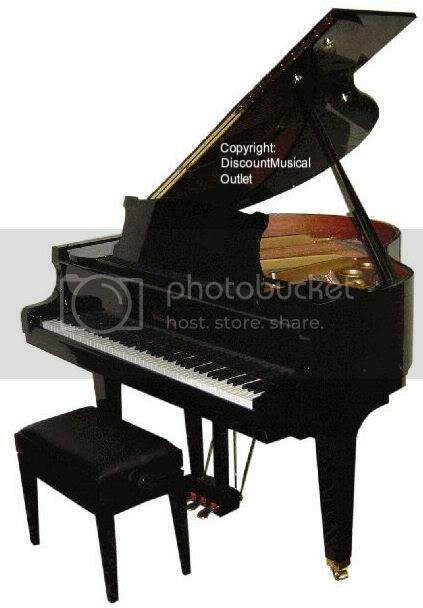 Cameron & Sons CSM-48 Baby Grand Piano, 4' 8' Manhattan Series, Matching Adjustable "Artist" Bench Included. CASE: High pressure, cross-laminated hardwood, German polyester finish applied with computer –controlled process that precisely applies material with no variance. BACKFRAME: 3 solid spruce beams. Rim constructed of finest mahogany. PLATE: Concert Scale design, hand machined and finished sand-cast plate. PINBLOCK: 21 –ply custom hand-fitted European style, made of select hard-rock maple. TUNING PINS: Cut-thread reverse torque, Chromium plated steel pins. ACTION: Made of highest quality straight – grain spruce and select maple, premier grade high density felt and genuine buckskin leather. HAMMERS: 20 lb. Select virgin wool, hand shaped and voiced. STRINGS: German Roslau, bass strings are hand wound. SOUNDBOARD: High quality Sitka spruce with spruce surface tensioner. Cameron & Sons grand pianos are handcrafted in the finest American piano traditions. Traditional piano construction methods are combined and improved with the latest, new computer controlled manufacturing and piano technology processes, awarded the ISO 9001 certificate, after extensive audit of quality control systems by the independent Munich-based audit organization. FREE NATIONWIDE DELIVERY BY PIANO MOVERS - SPECIAL OFFER ENDS SOON!